How do you stop your dogs from barking when left alone at home? How would you stop your dog’s constant and sometimes annoying bark on the walk? So the first thing you should understand is that barking is natural. It’s how dogs speak. Therefore it goes without saying that casual barking or the social barking is very normal. To control and correct excessive barking though, it will not happen overnight. It requires patience, effort, and consistency on your part. Keep in mind that the patience and consistency apply to everyone in your household as well. As always the first recommendation is to see the veterinarian, making sure your dog’s barking is not due to a physical or health issue. It’s a joy bark: Is he happy to see you? Is it a play bark? Is he barking during play time? Is it social barking? Is your dog barking in response to other dogs’ bark and/or when he sees other dogs? Is it anxiety or boredom bark? Is it a compulsive bark? Is your dog barking repeatedly for long periods of time? Is your dog obsessed with mirrors or shadows or other unusual things? Is your dog chasing his tail and barks at the same time? To me, personally, just a few joy and play barks are non-issues. And I am sure most people don’t mind their dogs barking out of joy or happiness when they see their masters after a long day at work. The bark becomes problematic and an “issue” when the dog does not stop barking, cannot be stopped from barking meaning does not listen to the command of either STOP or QUIET or a similar command to stop the bark. The territorial bark also is not much of an issue if the dog lives on a farm for example. It is actually most desired by farmers to have their dog/s warning them with a bark or a series of barks to announce danger or a stranger or something similar. But the territorial bark is not always desirable. An example is a dog who lives in an apartment, is left alone all day and barks at every little sound in the hallway. Or barks when someone knocks at the apartment’s door or at people talking outside the door, etc. In this kind of situation, the bark could also be due to anxiety and fear of being alone. According to Dr. Stanley Coren there are many types of barks which have different meanings depending on the pitch and intervals between the barks. For example: “A prolonged string of barks, with moderate to long intervals between each one: These sounds are really in the form of “Wuff”- pause – “Wuff”- pause -“Wuff,” and so forth. They are best understood as meaning, “Is there anybody there? I am lonely and need companionship.” This is most often the response to confinement or being left alone for a long period of time. So, similar to every other behavioral issue, there are no standard charts or set rules for the dog’s bark and reasons for it. Every case is different. Every situation must be evaluated individually and all the factors in play must be considered and examined. Exercise your dog: Walk the fido (the longer, the better), make him fetch and run. In other words, get him tired. Create fun with toys and treats: Provide him with intelligent or puzzle toys. In addition, give him a Kong with treats inside before you leave home. Find ways to engage and distract him so that he has no interest in barking all the time. Be Consistent: Do not give your dog mixed messages. Some dog owners want their dogs to bark at the strangers coming to the door and they encourage the dog to bark. But they don’t want their dog to bark at the guests coming to their home! How is dog supposed to know which is which? No Yelling or shouting at the dog: If you are trying to correct your barking dog with yelling and screaming at the top of your lungs, you are wasting your time. The result would be a scared dog and a frustrated human! You have to be calm, assertive and in control of your emotions at all times. Remember your body language should match your commands. No Muzzles or Anti-bark collars: Don’t use a muzzle or anti-bark device to quiet your dog (in particular when you are not home). Not only they are not effective but also they could malfunction and hurt your dog. In my opinion, they are not corrective tools (and if so, for a very short period of time) but actually punishment devices. They usually either make an ultrasonic noise or spray citronella when a dog barks. Studies have shown that sonic collars (collars that make a noise) do not work with most dogs. There are also come collars that use a microphone. So the question is what happens if you have more than one dog? One dog could trigger the collar with his barks while the one wearing the collar gets punished with a spray or shock. The crate is the right size for your dog. In a house, crate your dog in the quietest part of your home. Keep curtains drawn and leave the radio or TV on. The idea is to mask the outside noise and to minimize the visual stimuli. What size crate will I need for my dog? 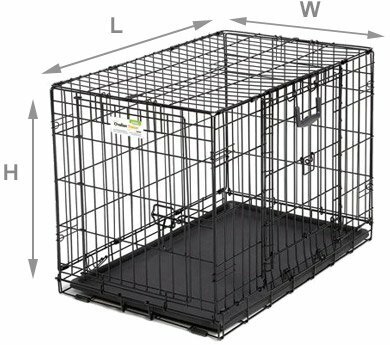 Dimensions for dog crates are typically represented by length (L), width (W), and height (H). Length: Measure the length of your dog from nose to tail. When measuring the tail, be sure to add approximately 2-4 inches to the overall length, depending on the size of your dog.Height: To determine the height of the crate you will need, measure your dog from the top of the head to the ground. If your dog has naturally erect ears, measure from the tip of the ears.Width: To obtain the width of your crate, add approximately 2 inches for smaller breeds and 4 inches for larger breeds. Talk to your neighbor: There are by-laws for dog barks with hefty tickets for disturbing the peace. Talk to your neighbors: If you live in an apartment and have received complaints from your neighbors about your dog’s barks, approach them and apologize. Make sure they know you are looking for a solution. Also, keep in mind that many municipalities have by-law officers who can issue tickets if a neighbor complains about your dog’s barks. Just recently the city of Hamilton hiked the fines to a maximum of $25,000 given to dog owners whose dogs are repeat offenders and who are disturbing the peace of others as a result of their constant barking. This Canadian city receives more than 600 complaints about loud dogs every year. THE LAST WORD: If your dog in addition to barking is also aggressive, growls and lunges at people or other dogs, is extremely anxious and barks excessively, at times for no good reason, I suggest contacting an experienced animal/dog behaviorist immediately. Previous postWhy do cats eat plastic or any other non-food items? Next postHow to Remove Cat Urine & Cat Urine Odor in Your Home? © FORTHELOVEOFPETS.BLOG 2018. Unauthorized use and/or duplication of this material without express & written permission from this site’s author and/or owner is strictly prohibited. Excerpts and links may be used, provided that full and clear credit is given to FORTHELOVEOFPETS.BLOG with appropriate and specific direction to the original content.